“We need more judges. It is not merely an issue of numbers but also of quality of judges. And a larger issue is the millions of people who still do not have access to courts”: Senior lawyer Harish Salve. “Centre cannot appoint judges in the lower courts and the state governments don’t appoint judges in enough numbers because it is not their priority”, Senior lawyer Kapil Sibal. Four of the finest legal minds in the country debated the issue of conflict between the executive and judiciary in the recent times triggered by the striking down of the National Judicial Appointment Committee law by the Supreme Court and the resultant standoff over appointment of judges. The participants- former Supreme Court judge Justice BN Srikrishna, former Union Minister Kapil Sibal, noted lawyer Harish Salve and Arghya Sengupta, Research Director, Vidhi Centre For Legal Policy agreed that the conflict between executive and judiciary are on the rise. 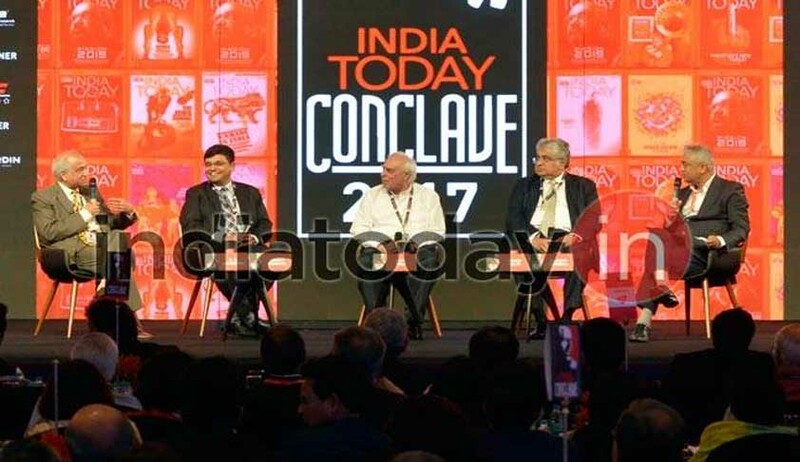 The venue was the India Today Conclave 2017 in Mumbai yesterday. Apart from debating the issue in detail, they also discussed the problems and possible way outs to avoid a clash between two key institutions of the government. According to a report on the India Today website, while legal researcher Arghya Sengupta said that he did not see any problem in 'frosty relationship between executive and judiciary', Salve blamed the government for judiciary encroaching upon the domain of executive. "When government shrinks, judiciary expands," Salve said adding, "If you invite a lion to walk on the streets, you cannot dictate it who to devour." Both Salve and Sibal objected to interference by judiciary in the BCCI affairs recently. The participants in the discussion agreed that the massive backlog at various levels of judiciary is among the critical problems faced by judiciary today. About 2.28 crore cases are pending in lower courts across the country, about 40 lakh in various high courts and over 68 thousand in the Supreme Court. "On an average 90 cases are listed per day per judge in the courts. Every Monday and Friday 60 matters are listed for a judge in the Supreme Court," Kapil Sibal said while highlighting the workload on the judges. Harish Salve pointed out that the judges-population ratio in India is highly skewed. "Ideally it should be 50 judges for every million population. In India, we have a sanctioned strength of 30 judges per million," he said. "In reality we have 13 judges per million population in the country," Sibal said adding, "Centre cannot appoint judges in the lower courts and the state governments don't appoint judges in enough numbers because it is not their priority." Justice BN Srikrishna said that the executive, lawyers and judges, all three are responsible for delay in justice delivery in the country. "Judges are not prepared themselves for the cases because they think the lawyers are not prepared for the cases. The lawyers think that judges would not be prepared, so they don't prepare. And, judges are overloaded because there are not enough judges in the courts," Justice Srikrishna said. Under the such circumstance the quality of judgement won't be good, the former Supreme Court judge said. Research Director of Vidhi Centre For Legal Policy Culture Arghya Sengupta identified adjournments in the courts as the real problem for delay in justice. He said, "Yesterday at the India Today Conclave, President Pranab Mukherjee said disruption in Parliament is a disease. Similarly, adjournments in courts of law are also a disease." Appointment of judges in higher judiciary has been a major bone of contention between the executive and the judiciary. Justice Srikrishna made an impassioned appeal to back to pre-collegium days as prescribed under the original Constitution. "Follow the earlier convention of appointing judges in higher judiciary. Before collegium system was introduced, the CJI used to recommend the names of judges to the President, who would approve the names if there are not major objection to the names. Reverting to that convention is the only solution," Justice Srikrishna said. Salve said that nobody seems to be serious about justice delivery system. "System of politicians appointing judges is not acceptable. System of judges appointing judges is also not acceptable," Salve said adding, "The NJAC judgement of the Supreme Court was unconvincing." Justice Srikrishna said that increasing the number of judges and providing better infrastructure are the two measures that would make the justice delivery system quicker in India. Sengupta said that better and deeper use of technology in judiciary would provide solution to judicial backlog. "Aadhaar-like system be introduced in judiciary so that the status of cases and engagement of lawyers can be made transparent. No lawyer should be given two cases at the same time." "Increase the number of judges in courts, hike their salaries and increase the age of retirement for judges," Sengupta further argued.